Didn't find the color you were looking for? Call us to custom order! Room of Choice Delivery - designated room of your choice (up to 2 staircases). Does not include assembly or trash disposal. Our most popular collection! The Jack collection by Jennifer Taylor Home is the perfect addition to any living space looking to add a bit of a modern flair. 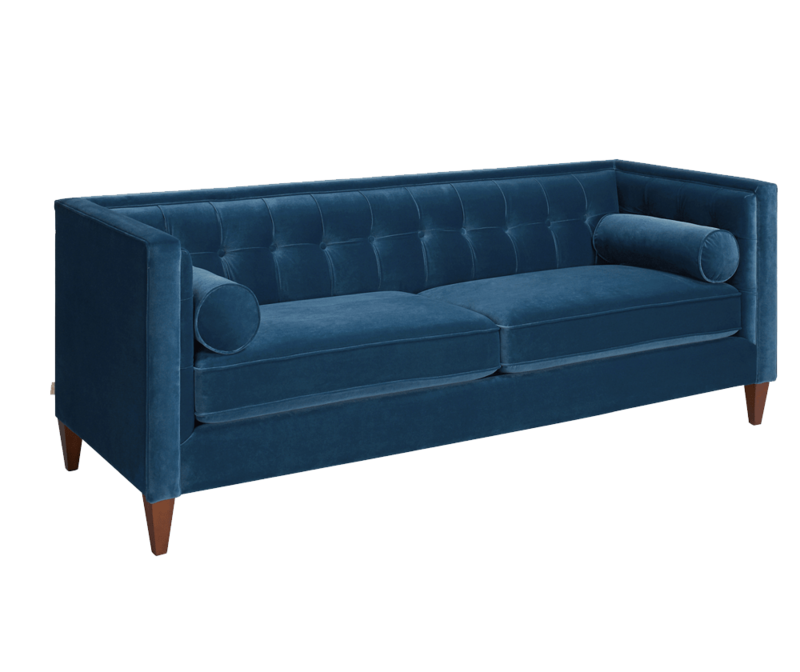 Crafted beautifully with solid kiln-dried birch wood, upholstered with high-quality fabrics, and accented with diamond hand tufting along the back and inner arms with decorative cord outlines, this mid-century tuxedo sofa brings class, style, and lounging comfort to any room in the home. Crafted from birch wood, a deciduous hardwood that isn’t easily mottled or discolored over time. Birch is ideal for furniture making as it is durable and doesn’t warp easily. Get an in-depth look and see why we take pride in the quality of our products. Hand-tufted backing, velvet upholstery, and two bolster pillows. Wood frame crafted from kiln-dried birch wood, a deciduous hardwood that isn’t easily mottled or discolored over time. Available in over 10 stylish eye-catching colors. Ideal choice for the entryway, hallway or living areas. This 3-seater sofa brings class and lounging comfort to any room in the home. We offer a unique versatility in design and make use of a variety of trend inspired color palettes and textures. Our products bring new life to the classic American home. Oversized Item Delivery Policy: This item will be shipped via freight carrier to your home, excluding rural routes, remote areas not in close proximity to areas commonly serviced by freight carriers, islands, APO/FPO addresses, P.O. Boxes, Alaska and Hawaii. Please provide your daytime and evening phone numbers during check out so our carrier can contact you to schedule delivery. 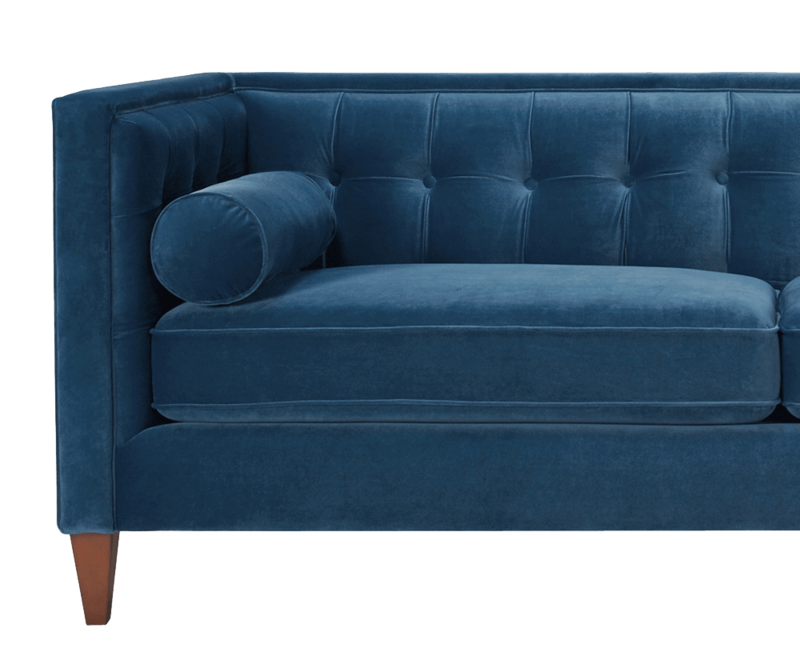 The navy blue Tuxedo Sofa is great! We love the sofa! We got it for a room where we don't sit all the time so admittedly, I have not sat on it a lot yet but I was worried about how comfortable it would be and it's really comfy so far! It's also BEAUTIFUL! The navy blue is gorgeous. It's really a rich blue color and makes the couch looks very classy. I could not be happier with my purchase. ABSOLUTELY LOVE this sofa! Not only is it durable & great quality but it looks amazing in person. The color is vibrant and can be mixed with many color options. It is firm yet very comfortable as well. I purchased this couch for my makeup studio. It is amazing!!! So soft. So pretty and the color is just fab. I purchased a decorative pillow to go with it. Would highly recommend. It’s nice and firm and the structure seems very solid. It took a little time to get to me but the delivery service was great. LOVE! This sofa is wonderful!! It is an ivory color, just like the photo. It is a very nice linen fabric. I purchased it for a living room and it looks amazing. It arrived quickly and in great shape. I purchased this couch on the word of many many positive reviews. And boy am I glad I did! It's simply stunning in person. I'm in love with the color, pink, but more a subtle, vintage inspired pink. It's oh so plush and comfortable. I've received so many compliments. I ordered the matching chaise and together they are furniture magic. AMAZING! Since it arrived, every person who has come to my house has commented on how great it looks, but more importantly on how comfortable it is. It's also the perfect shade of pink; it's not so bright and obvious that you're immediately bombarded by pink, but it's interesting enough that it stands out in all the right ways. My only regret is not buying it sooner! Gorgeous sofa! Used in an apartment and was the perfect size! Fabric is soft but luxurious to the touch! Button tufting is perfect! Extremely comfortable as well as stylish! Looove the color. Perfect size for our space. Sturdy and comfy at the same time. Great quality for the price. Even better than I imagined.